Next week I’m going to a BBQ with a Western theme. The invitation arrived weeks ago and since then I’ve tramped through thrift stores and flea markets from North Vancouver to Packwood, Washington. I’ve assembled enough pieces to pass muster: a pale blue cowboy hat, a darker blue fringed jacket and a pair of black cowboy boots. 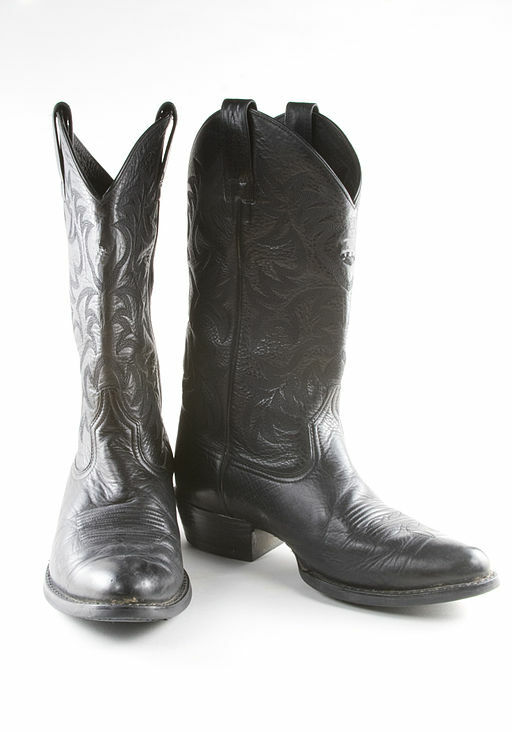 In design, leatherwork and condition, my boots are very similar to this picture. Turn them upside down and they tell a different story: they have been re-soled and re-heeled many times. I’ve started wearing the boots around the house to get used to the feel of them. When I pull them on, a strange thing happens: I walk differently. I channel their former owner. I feel the way the arch of her foot shaped the vamp of the boot. I close my eyes and press down on the ball of the sole and see dusty paddocks, smell the sage-scent of horses, and feel the burn of the desert sun. My own filter turns off; I start taking photographs of her life. Then I turn the tables and try to see my life as she would. When I boarded the Queen of Oak Bay ferry on Tuesday I imagined the previous owner of these well-worn boots clapping eyes on the huge car ferry for the first time. To me, BC Ferries are just part of the highway system: a route that connects BC’s islands to its mainland. To travellers unaccustomed to the busy-ness of the ferry terminal and the power of the ships, it’s an exciting part of the journey, fraught with joys and risks that habituated users often fail to see. Tuesday I looked the vessel with fresh eyes. I really think I write about everyday life. I don't think I'm quite as odd as others say I am. Life is intrinsically, well, boring and dangerous at the same time. At any given moment the floor may open up. Of course, it almost never does; that's what makes it so boring. Are you like Edward Gorey? Do you see the floor opening up underneath you, sweeping you into another world? Or is your filter on and all you see is the ferry line up and another delay between you and your destination?